Did Europe's Mars lander crash and burn on the Red Planet? The European Space Agency’s Schiaparelli Mars lander plunged into the planet’s atmosphere Wednesday, survived the hellish heat of entry and successfully deployed a huge parachute to slow down before falling free and firing up its braking rockets to land on the martian surface, engineers said Thursday. But then suddenly, its signal vanished. Fifty seconds before the expected touchdown, the experimental lander abruptly stopped transmitting telemetry. At that point, it was expected to be less than a mile above the surface and descending at about 150 mph. It’s not clear from a preliminary analysis of the data whether the lander could still be intact. “There’s a point where the parachute is released, and this is where the data we have preliminarily analyzed from the (lander) do not match exactly our expectations,” Andrea Accomazzo, ESA’s director of solar and planetary mission operations, told reporters during a briefing Thursday. 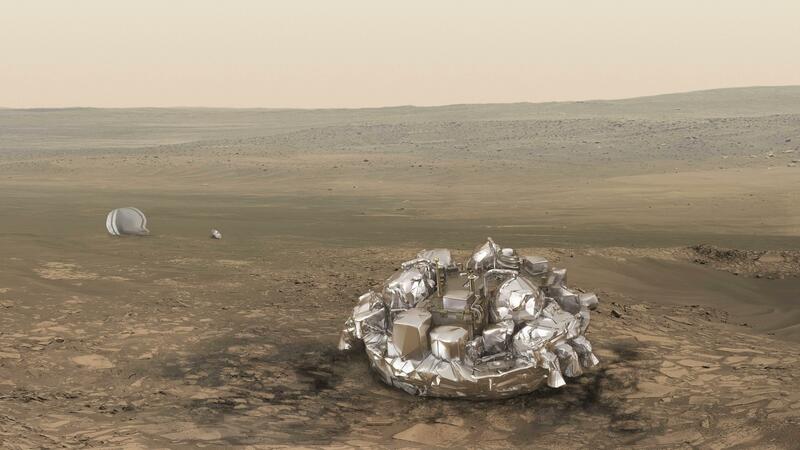 But Schiaparelli transmitted detailed telemetry to the ExoMars Trace Gas Orbiter mothership throughout its descent and Accomazzo said engineers eventually will be able to figure out the exact sequence of events to determine what went wrong. “I have personally no doubts we will be able to fully understand what happened during the descent and maybe reconstruct where Schiaparelli is and in what condition,” he said. Additional attempts will be made to contact Schiaparelli during overflights by ESA’s Mars Express orbiter, the TGO and NASA’s Mars Reconnaissance Orbiter. Flight controllers also may attempt to contact the spacecraft with commands sent in the blind. Whether those attempts are successful or not, mission managers said the lander had achieved a major objective by sending back detailed telemetry that will help engineers understand exactly what happened and how the spacecraft’s systems operated during an actual descent to the martian surface. “Given the amount of data we will have acquired through Schiaparelli yesterday and given that the whole point of Schiaparelli was to acquire practical experience, all of the data feeds directly into the 2020 mission,” said David Parker, ESA’s director of human spaceflight and robotic exploration. The Trace Gas Orbiter, with Schiaparelli bolted to its side, was launched by a Russian Proton rocket last March, the first step in an ambitious multi-mission European Mars program with the long-range goal of exploring the planet with sophisticated orbiters and rovers and eventually bringing rock and soil samples back to Earth for analysis. The methane-sniffing Trace Gas Orbiter, or TGO, was designed to search for the chemical traces of past or present biological activity while the lander, ESA’s first at Mars, was intended to serve as a technology demonstrator to help European engineers gain the practical experience needed for a planned rover ESA hopes to launch in 2020. The battery-powered lander, equipped with a modest suite of science instruments, was only expected to operate for about a week or so. The TGO spacecraft released Schiaparelli on Sunday and both spacecraft reached Mars Wednesday morning. As the orbiter successfully carried out a long rocket firing to brake into a preliminary orbit, Schiaparelli began its descent to the surface, hitting the top of the discernible atmosphere at an altitude of about 75 miles and a velocity of 13,000 mph. Throughout the six-minute descent, the lander transmitted a steady stream of telemetry to the TGO mothership, which recorded the data and relayed it back to Earth overnight Wednesday. Protected by a state-of-the-art heat shield, the lander quickly decelerated, presumably to a predicted velocity of about 1,000 mph, before deploying its supersonic parachute. By that point, Schiaparelli should have been at an altitude of about seven miles, but that has not yet been confirmed. In any case, the flight plan called for a parachute-assisted descent to an altitude of less than a mile above the surface, at which point Schiaparelli’s flight computer was expected to release the parachute, allowing the lander to freely fall on its own. At almost that same instant, nine hydrazine-powered thrusters were expected to fire, stabilizing the spacecraft and reducing the velocity to a few feet per second. Finally, at an altitude of about 6.5 feet, the engines were programmed to shut down, allowing the lander to drop the rest of the way to the surface. But the telemetry suddenly stopped right around the moment the parachute was released. The recorded data show at least some of the thrusters fired for a few seconds at least, but engineers have not yet had time to tease out altitude, velocity and other details that might shed light on what happened in the 50 or so seconds between the loss of signal and the lander’s impact on the surface.